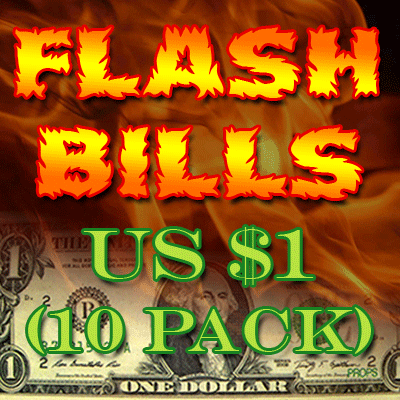 Today, when you order "Flash Bill Ten Pack ($1.00)", you'll instantly be emailed a Penguin Magic gift certificate. You can spend it on anything you like at Penguin, just like cash. Just complete your order as normal, and within seconds you'll get an email with your gift certificate. Order in the next 1 minute and it will ship TODAY! Printed on one side, you can't tell from a distant whether it's the real bill or a fake one. Excellent for close-up magic. No smoke and ash left after burning. Pack contains ten U.S. bill-sized sheets of flash paper. The bills look pretty good. From a distant, just like a real bill. I wouldn't, however, have the bill completely unfolded to display. I've purchased the bills twice now. The first set were perfectly fine. My recent purchase, not so much. Somehow the printing must have gotten messed up, because my bills are noticeably pinkish/orangey!!! Do they not check the bills for flaws before packaging them? Perhaps the tint will give it all the more reason for being any regular bill, but I don't like it. Though I've gotten some pretty good responses from these, I think they're pretty pricey for what you're getting. Unless you're a perfectionist, maybe just use a small piece of regular flash paper instead. These bills are beautifully printed on one side and look real enough to fool folks even at a close distance. You'll probably only want to use half a bill at a time (folded into a small packet to look like a whole bill), as they burn bright and long. No discoloration in mine and they match a slightly used $1 perfectly. 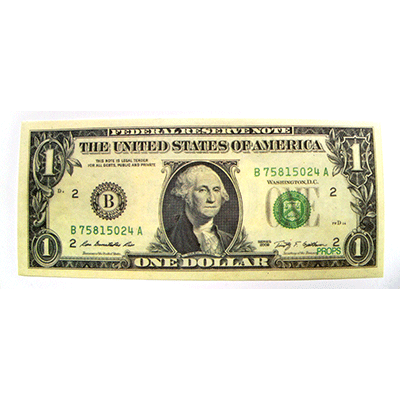 I found this product to be very cool and very useful but the only flaw is that the bill is one sided. I was able to perform with it a few times but one time at a party I was holding the bill abit too funny and someone snatched the bill out of my hand and revealed it was real. Overall though these flash bills are very cool and give off a great effected just keep in mind that they are one sided. I have used flash bills for over 30 years. These are the best looking flash bills I have ever used. I would like them to be printed on both sides, although I know that will affect their flammability. Quality product! I used it for the pen through dollar through dollar effect. Burned bright and maybe a bit long (my fault). Hit the rug in the house I was performing in. No harm done. On flash paper, sometimes it's hard to get a good color match. But fold it in half and keep it moving, and no one will notice. Looks great in any trick with paper money.